Hey! Americans! Let’s show ‘em what happens when we put our heads together. Traditional America’s Cup challenges have amassed resources first, to facilitate attempts to corner the experience and innovation markets: (as if!). What if we just assume that, by democratizing discussions of the class rule – worthwhile design ideas will percolate to the surface of their own merit, and the process of heating the brew will be fun? And, if we do a good enough job, the ideas themselves and not the capital hoarded to promote their birth will spring to the surface like dandelions growing out of sandy cracks. 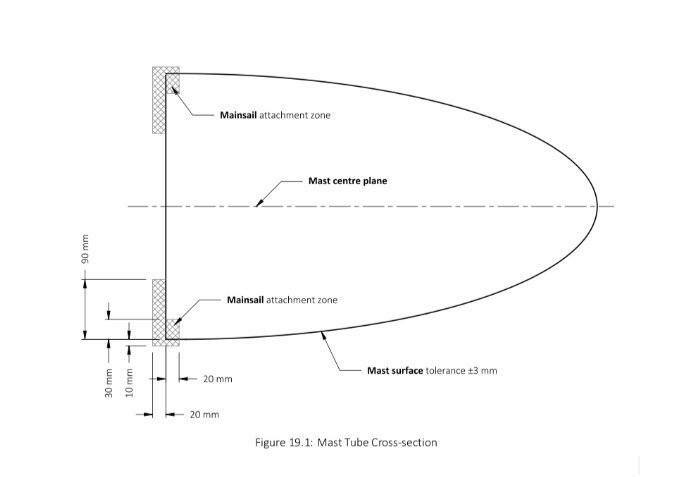 Here’s an example to get us started, concerning AC75 mainsail design. I find rule 19.26 very interesting. 19.26 The mainsail shall be equipped with solid buoyant material or inflated air bags in order to provide positive buoyancy near the top of the mast. There shall be at least 300 kgs of buoyancy from all combined mainsail buoyancy systems when submersed in salt water with an assumed water density of 1025 kg/m3 and the combined weight of these systems shall be at least 3kgs. The centre of volume of all mainsail buoyancy systems shall be within 1.5 m from the uppermost head of the mainsail and if this centre of volume is greater than 0.5 m from the uppermost head then the minimum buoyancy and minimum weight of the combined buoyancy systems shall be increased by 100kg and 1kg respectively per metre below beyond this limit. Any ballast required to meet the minimum weight requirement of this rule shall be added at the same height above MRP on the mast tube as the centre of volume of the combined buoyancy systems. Looking at the shape of the back of the mast, this seems like precisely where I’d hide my intention to use bladders to control sail shape. Of course, with the mainsail attachment points on the outside edges of the mast maybe we can do it all with the skins. But maybe drag – at the top of the mast especially – is such a big deal that more control would be nice? I want to share how I got to this idea, not to prove it will come to pass or even that it’s a good idea – merely to show where many good ideas eventually stop. Notice how interesting 19.26 is, in a world of things like bladder kites etc. Revisit rule 19.26 and find it Really Interesting. There are a million more unicorns in the rule, hiding in plain sight. I won’t find them all by myself, but neither will isolated design teams. And, instead of assuming we’re the smartest isolated design team, why not simply mitigate the advantage of any resource or head start by crowd-sourcing picking apart the rule? It could be really quite fun.